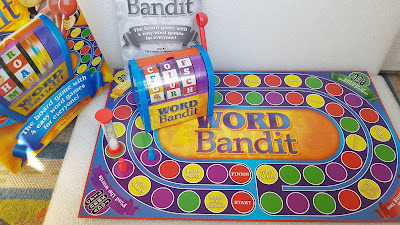 This week we've been playing a new game from Drumond Park called Word Bandit. 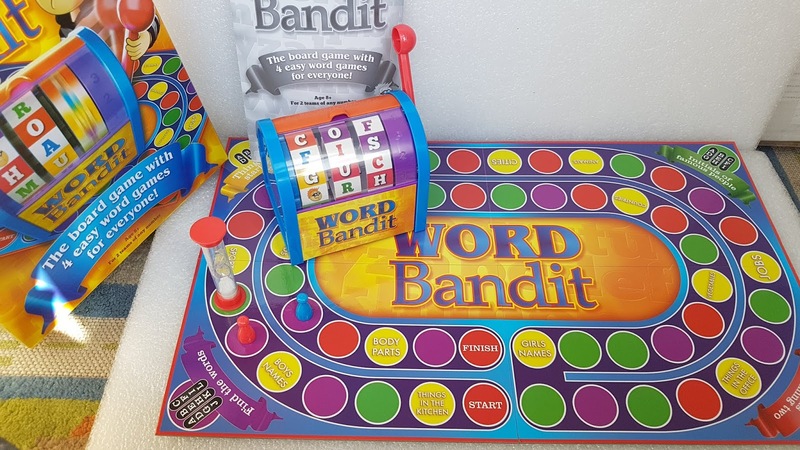 Word Bandit is a brain-teasing, family-friendly game aimed at children aged 8 years and over. 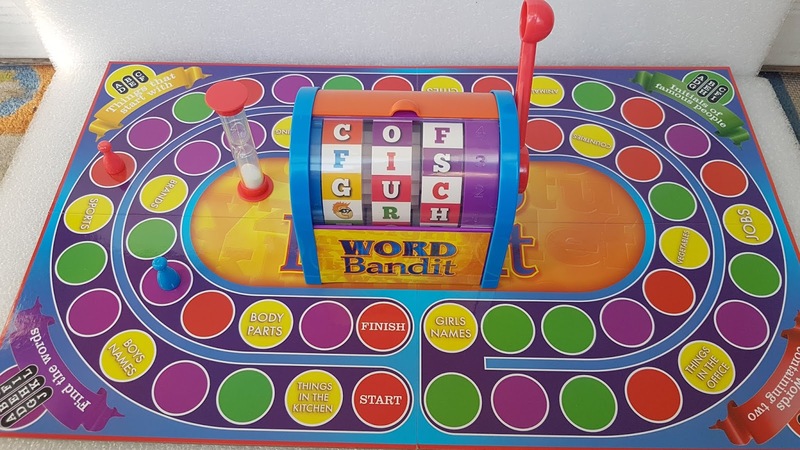 Yes, it is a board game but with a difference because at the centre of the game is a wheel-spinning letter machine, just like a small ‘one-arm bandit’. The game is made up of four easy word games which can be played in two teams made up of any number of players. 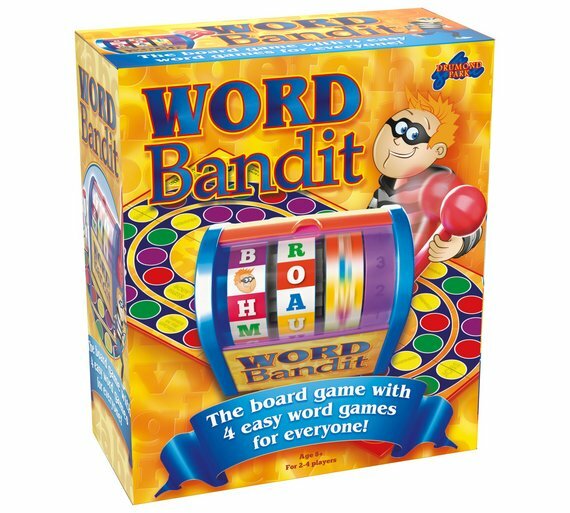 Getting ready to play is simple as all you need is the board, the bandit machine, the sand timer and your two team pieces. The board folds out quickly making it easy to set up, so it's a nice game to play as the setup time is literally just a few seconds and anyone can do it. Each team picks a playing piece and puts it on the red START space. They then take it in turns to move around the board, one space at a time. The colour of the space you land on dictates which of the four games your team will have to play. One of the team members pulls the bandit’s handle to spin the wheels each turn, and the opposition counts the score. Open the sliding cover on the machine to reveal four rows of letters, then pull the handle to spin the word wheels, which come up with a set of random letters. The aim is to race the timer to find as many words as possible that wind around the grid of letters. Three rows of letters will be revealed, spin the word wheels to start the game. The aim here is to find the INITIALS of as many famous people as possible during one turn of the timer, and here – the letters do not need to be touching in the grid. From Beyonce to Snow White! Using two Rows this time. Spin the word wheels as before. Your playing piece is on a yellow space with a category printed on it (e.g. Boys’ Names). You must come up with as many words as possible in that category beginning with one of the letters on show. You can use any letter as many times as you like, as long as the words are different. Using just one row now, spin the word wheels. Here, you have to call out as many words as you can that contain any two of the letters you have spun. The letters contained in your words can be in any order, and repeating the letters in your words is OK. Master wordsmiths may choose to think up words with all three letters in them! We found it a little tricky at first as there are four different word games to play depending on which coloured spot your team lands on but we soon got used to it and it's OK to keep the rules with you to refer back to when needed. Word games are always great fun and ones we'd often play in our house as they're a great way to make playtime, educational and fun. Priced at just £24.99 I think it's going to be popping up on a lot of children's Christmas Lists this year. Both my younger two, aged 8 and 11 years had great fun playing it and would happily have added it to their Christmas List's if they didn't already have it. I love the fact that they can play with just the two of them, they can set it up themselves and play happily. Giveaway Time - Who wants to win one? I like the look of Articulate. Og on the Bog looks like a funny game! Rapidough! I haven’t played it for years! I really like the look of articulate your life, thanks for this lovely giveaway. I like the sound of “Word Bandit” I think it will be great family fun. The logo board game looks like great fun! The Logo board game looks like a game the whole family would enjoy!